The Greater Bandon Association has named the November recipient of its Volunteer of the Month award. Gail Nordstrom becomes the first winner of the year as GBA begins its second year making this award. 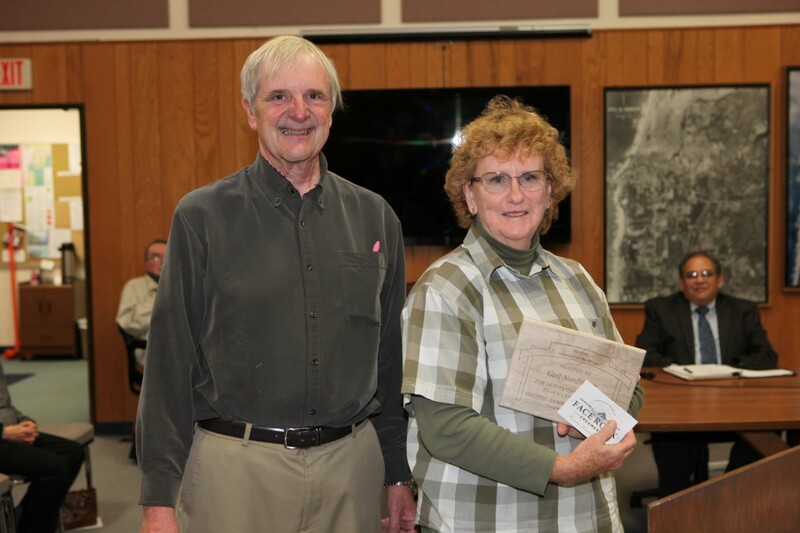 She was presented the award in the form of a plaque and a gift certificate donated by Face Rock Creamery at the November 7th, 2016 meeting of Bandon’s City Council. Gail is best known as an avid volunteer and the treasurer for Everyone at The Table (EAT), Bandon’s 501(c)3 meal program for those on limited incomes. EAT serves about 45 people a hot, nutritious, home-cooked meal every Tuesday at 5:30 p.m. at The Barn. EAT was established in 2004 and Gail has been cooking for them since the very beginning. Gail’s impact on Bandon’s community is incredible and we are so thankful to have her as a part of our community. Thank you, Gail!